Today marks the 92nd anniversary of the ratification of the Nineteenth Amendment – a victory that finally gave women full voting rights. 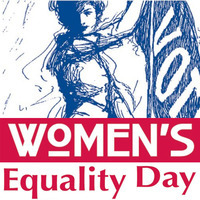 Almost a century later, it’s an opportunity to celebrate women’s voice in politics and policy and to take a good look at the work that remains to be done on the path to equality. As we reported on Friday, the preliminary findings of the 2012 Status of Women in North Carolina report released last week by the North Carolina Council for Women show that despite women’s higher levels of education and the significant increase in labor force participation over the past decades, wage and income inequality persists. The wage gap continues: Women’s wages continue to be lower than men’s wages in the state, adding up to approximately $7,000 per year or $135 per week less than the median annual earnings of comparable men. The wage gap is even greater compared by educational level: For instance, women with at least a college degree earn more than $20,000 less per year than comparable men. This amounts to a wage gap of 29 percent. More women continue to live in poverty. 17 percent of women compared to 13 percent of men in North Carolina lived in families with incomes at or below the federal poverty threshold. 34 percent of Hispanic women, 25 percent of African American women, and 25 percent of American Indian women in North Carolina lived at or below the poverty line. Our labor force looks much different than it did 50 years ago. 2.3 million women are in North Carolina’s labor force, and 42 percent of working mothers are the family’s breadwinner. Close to 7 out of ten families with children under 18 have all parents in the workforce, and 59 percent of women with children under the age of five work. Yet, discrimination persists and workplace policies don’t reflect the reality of our workforce. Affordable, quality child care is essential for working parents, but for many, the cost is out of reach. Moreover, almost half of North Carolina’s private sector workers don’t have access to paid sick days to address their own health, and even fewer can take time off to care for their sick children. Only one in ten workers in our state has access to extended paid leave when welcoming a new child or when illness strikes. These are hardly “perks.” They are policies that allow workers to hang on to their jobs in an uncertain economy and to work toward economic security. Today, in honor of Women’s Equality Day, in almost 20 states and cities across the country (including Asheville), 9 to 5’s Day of Action focused on the great need for paid sick days. And there are campaigns for better work-family policies all over the country, including here in North Carolina. We still have a long way to go, but we are moving forward.